Vigorous, free spreading, mat forming evergreen alpine. Alternate, cylindrical, grey-green leaves. 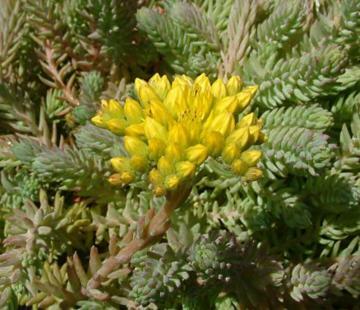 Upright stems carry clusters of star-shaped yellow flowers in summer. Well drained, poor soil in full sun or part shade. Large rock gardens, dry banks and gravel gardens. From mountainous areas of Central and Western Europe.